Challenge 4. We decided to let other people play this year, so roped in friends Peter ‘RP’ Campbell, Phil McHoul and Zak Newland and covered a Beatles album. Yes, that Beatles album. We were each randomly allocated tracks from Sgt. Pepper and had to cover them as best we could. I got ‘She’s Leaving Home’, ‘Lovely Rita’ and ‘Good Morning, Good Morning’. I actually found this really hard to do – I almost gave up at one point. My version of ‘She’s Leaving Home’ sounds a bit like Martin Carthy with synths (think ‘Palaces Of Gold’), ‘Good Morning, Good Morning’ sounds like Oasis done on a ZX Spectrum (the wonderful Mr Aidan Smith liked it though…) and ‘Lovely Rita’ was a scratchy acoustic dictaphone job – with whistling. High on charm, low on fi. This was all recorded in 2004, but due to curator Gareth (a) not having any stamps (b) not having any CDrs (c) not having any printer paper and (d) his ceiling falling in, was not actually released until 2005. Fair play to him for doing the sleeve though, which featured all our heroes (50 in total). That’s an awful lot of head cropping and positioning – click on the image for bigness. Special mention should go to Gareth’s snarling Coxonesque ‘When I’m 64’, Phil’s lunar-prog ‘Within You, Without You’, Zak’s wonderfully stripped down post-punk ‘Being For The Benefit Of Mr Kite’ and RP’s equally austere and bizarre ‘A Day In The Life’. Free copies of this were sent far and wide (advertised on various internet forums) to universal bemusement. Christ… Any copies of this knocking about? Love to hear it. 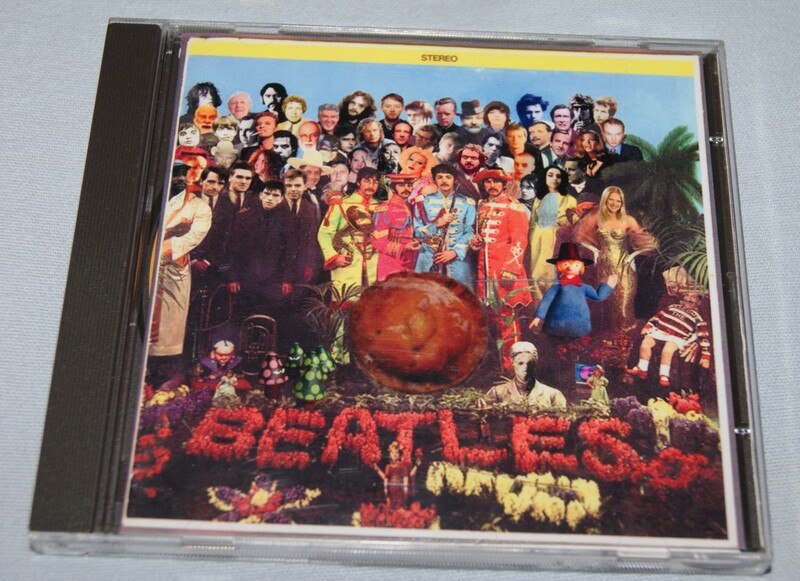 Its only me fave Beatles album..
I’ll sort you out boss.